Fresh corn cobs are still available at the farmers’ and outdoor markets and after eating my fill of boiled corn on the cob, I wanted to use it in some other way. After a disappointing corn waffle at one London restaurant, I thought I’d cook my own corny brunch one past Sunday. Since I don’t have a waffle maker/grill, I thought I’d make fritters instead. These turned out to be more like pancakes as I didn’t use much oil to fry them. The corn fritters turned out gorgeously toothsome being chock-full with all those fresh corn kernels and when paired with some streaky bacon, became even better. Taking it all to another level was the honey I drizzled over them! I think maple syrup would be lovely too, the sweetness matching perfectly with the sweet carbiness of the fritters and saltiness of the bacon. adapted from a recipe by Bill Granger. 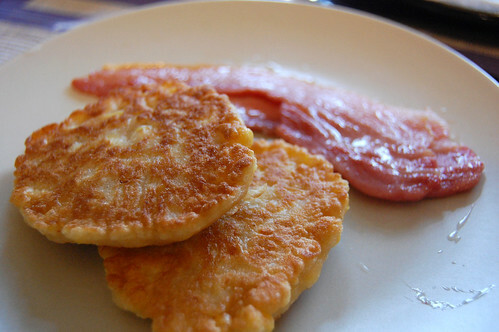 Serve with rashers of bacon on the side and honey or maple syrup to pour over. Great idea! Corn fritters are great, especially if you happen to have any okra in the house… thanks for the recipe! Good Friday evening to you Su-Lin ! Those corn fritters sound so good with bacon and maple syrup ! Ohhhh, YUMMM ! Yum, what a great addition to breakfast. I love that sweet and salty combo. Boots in the Oven: Okra fritters too? That sounds yum! Loving Annie: They’re lovely and so perfect for brunch! The bacon we had was particularly swell too! Marie: It’s the corn that makes them wholesome, no? Actually, I thought of you and your blog when I was writing the post! gaga: So do I! Seems to be quite a classic combo. Ooh, yum! I made similar corn fritters once, from a recipe I’d gotten from another blog. The stroke of genius in that one was feta, but I love the idea of sweetness on top, especially when bacon is involved. Helen: I’m guessing you’re talking about the aubergine, not the corn fritters? Yes, a whole vatful of oil is probably needed to fry one! hannehanne: I like the idea of the feta – must’ve been good with the sweetness of the corn. Thanks! 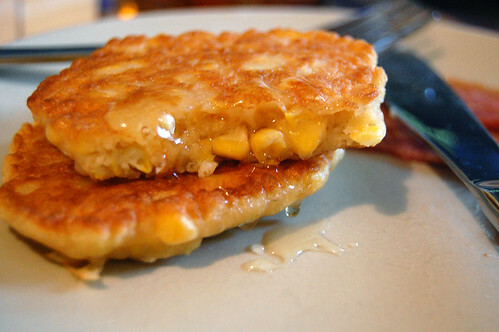 Corn fritters are impossible to enjoy unless topped with pure Amish Ohio maple syrup.